Just returned from the one night only screening st my local AMC theatre and was not disappointed! The film reminded me of all the flicks I used to see in the theatre with my dad back in the 80s/90s before they all became Marvel/fast and furious type of movies. The action was top notch and while the story is what you would expect from this kind of movie, sort of just a set up so all the stars can kick the hell out of each other and man do they ever! The director Jesse Johnson did a great job in letting everyone get there screen time and able to show there signature moves (Jaa's elbow/knee strikes, Adkins flip/spin kicks) the action was quite impressive, better than most big Hollywood films. Fans of martial arts/action films will not be disappointed as well as fans of the individual stars. All get pretty equal screen time. The finale as well as a great sequence in a police station are the highlights! Support this movie and rent on demand, buy blu Ray etc. Great job to all involved! What a Wonder the Digital Technologically Advanced Cameras Are Now !!! Back in Bruce Lee's time he had to dumb down his movements so the cameras could capture his Fighting !!! No need for that now as they went full speed with the Excellent Tim Man Choreography with full contact connecting blocks, hits and kicks !!! But unfortunately the fights were too short, as in real life !! These were not 13 round prize fights that go the distance !!! There were some interesting one on one fights but the fight that got the most audible exclamation from me was a short one between JeeJa Yanin and Iko Uwais with a tragically short conclusion !!! The End Boss Fights should have been longer and more epic but maybe in the sequel they will make them longer !!! I think the subtitles in the beginning had a double printing error as I had to sit one row closer to read them !!! I didn't like the One Night Only gimmick but now I see that there are more showings starting on March 22, 2019 but the theaters will be fewer !! !There was a short featurette at the end of the film with cast interviews and reflections about making the film that half the audience didn't stick around for because they came in late or saw the credits and left !! !There were more than a few Martial Artists and Asian Action Stars that weren't Highlighted in the trailers. Tim Man (Kill Em' All) was the Principle Fight Choreographer with assistance from Kazu Patrick Tang (Raging Phoenix) and Cullet Eric (Mercury Man) and a whole team of amazing martial artists and stunt persons. On screen there was Ron Smoorenburg (Who Am I? )and Dominique Vandenberg (Green Street Hooligans 2) who were the other members of the Hit Squad !!! Ron had a good lethal fight with Tiger Chen !!! Selina Lo (The Debt Collector)played the Boss who hires Scott Adkin's Team to kill Celina Jade's Character , Xian Xiao . Micheal Wong ( House of Fury) played a Contact of Tony Jaa's Character, Payu.Now for the Matchups ~ Scott Adkins went full Mad Dog Mode taking on Tony Jaa and Iko Uwais during a round before Iko got eliminated and Tony went Full Ong Bak Mode to end the fight !!! Michael Jai White (Blood and Bone) went full Bone Mode on Iko Uwais who got an assist from Tiger Chen !!! Michael Bisping took on Tiger Chen twice and shows why he has the world's hardest head in the UFC !! !Now for the negative ~ The Demeaning Racially Derogatory Slurs from the script that Scott Adkins , Michael Jai White and Michael Bisping constantly spew out in reference to the three leading men. Jungle Boys , Little Monkeys , etc. Not necessary really !!! Other than that and Iko Uwais in the role of basically a Jobber ,but with a cerebral strategy , did I have no other problems with the film itself !!! But still the fights got my adrenaline pumping so sometimes the good outweighs the bad !! !Well I already preordered the Blu-ray from Best Buy for $17.99 over a month ago. Can't wait to see it again on May 14th or sooner !!! 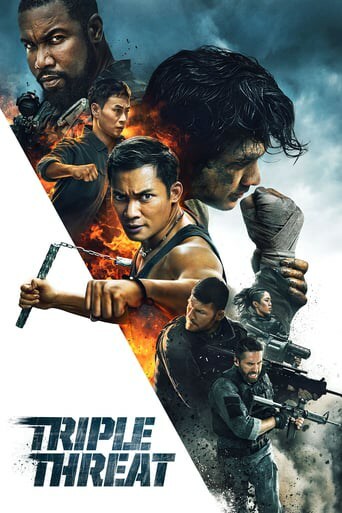 Downloading Seeding Triple Threat (2019) [WEBRip] [720p] [YTS.AM] from to 0 peers.